Many people think of Newtonian physics as an outdated model. After all, how can a 350 year old theory built upon an apple falling on someone’s head be relevant to today? In fact, the concepts that Newton laid out in his Principia in 1687 remain remarkably robust in explaining most of the physical phenomena that we experience in our day-to-day lives. It’s only at the extremes of macro and micro scale that classical mechanics fail to explain observations from the natural world. While not quite at the “Newtonian” level, the Wins Produced model has proven to be a very robust model for understanding NBA player performance and in predicting team performance. Wins Produced has many other positive virtues that I look for in determining if a mathematical model is useful and, most importantly, actionable. In fact, I’ve outlined these values in a previous post. Nevertheless, as we are wont to do in the blogosphere, the hyper-critical among us will focus entirely on the inevitable limitations and flaws of a model, no matter how useful and reliable that model may be. In many ways, this is a good thing. It helps us to constantly rethink and refine the model, improving both its descriptive and predictive power. Still, if we fall into the trap of focusing exclusively on the flaws, we incur the proverbial risk of throwing out the baby with the bath water. Like classical mechanics, Wins Produced begins to show its limits at the extremes. When a 7-footer like Dirk Nowitzki plays a game that is closer to that of a swing forward than that of a power forward/center, many have (legitimately) argued that the Wins Produced model undervalues him by assessing him exclusively in light of his listed position of PF. But don’t get me wrong; there is some logic to the current approach. If a coach plays Nowitzki at PF, it’s unlikely that he is using the other forward slot for another PF-type player. This leaves the rebounding and shot-blocking production we’d expect from a power forward to a player who is actually not playing that role. The counter-argument to this suggests that blame should be put on the coach, not the player. After all, we shouldn’t penalize Nate Robinson if Coach Thibodeau decides to slot him in at center on the scorecard. It is also important to emphasize that, on the whole, the WP model focuses more on the “what” than the “how”. Until now, we’ve been happy to say “we don’t care whose fault it is, the player is under-rebounding.” Whether the player or the coach gets the blame has been treated as secondary. However, as it turns out, the position adjustment in the WP model is just about the last and the most superficial of the steps in the model. It comes after all of the real analysis that translates the box score stats into raw wins produced. Therefore, it may be reasonable to suggest that the position adjustment could use some tweaking around the edges. My purpose in this post is not to introduce a revised methodology for the position adjustment. Rather, my goal is to start the thinking process for what a revision might look like. I’ll leave it to Prof. Berri and WoW’s Chief Analyst, Arturo Galletti, to figure out how exactly to incorporate this into their latest revisions of the model (coming soon!). Conveniently, this also shields me from the inevitable hyper-specific criticisms that usually come along with a post like this. I only intend to outline the thinking and to lay out an example for how this might be approached. If you’ve got a different idea on the specifics, heck, it might be better than mine. Comment away! As I mentioned before, a player’s listed position in a game may not always be reflective of the role that he was actually expected to play. If a coach wants to play “small ball”, there is still one player who is listed at center. Clearly this player isn’t playing center and, indeed, his team may be suffering as a result of the roles being played and the problem with the small-ball strategy. However, the player may still be playing his assigned role. It’s up to the coach to ensure that a lineup is sufficiently balanced to cover all of the roles that are necessary to win the game. Let’s go back to our Dirk example. Nowitzki may be listed at center or power forward, but his role on the team seems to better approximate a small forward. He takes a lot of threes, distributes the ball a bit more than is typical for a big and pulls in fewer offensive rebounds (probably because he spends more time further away from the basket). Now, instead of taking the listed position as gospel, what if we were to calculate his position based on his style of play (as approximated by his box score stats)? One would imagine that Nowitzki’s position would change under this scenario. In fact, this is indeed the case — not only for Dirk Nowitzki, but for some other prominent players as well. After calculating new positions for each player, we can now consider a new position-adjustment for the Wins Produced stat. To start, we look at how the players’ raw performance (AdjP48) is distributed among the new calculated positions. I am of the opinion that the curve should remain flat after reaching its nadir. After all, why should we punish point guards for being so good at their jobs? The answer that many will offer is based on the belief that PGs can only be played one at a time. Therefore, there is a strong opportunity cost of playing a PG since he is the only PG that the coach can put on the floor at that time. I would argue that 2013 presented a direct challenge to this assumption. When they played together, Calderon and Lowry as well as Felton and Kidd were productive pairs and their teams played very well as a result. While time with the ball is certainly a limited commodity (unfortunately, as it is currently calculated, the Usage stat is not a very useful control for this), I contend that it is a less limited commodity than space in the paint. Still, I’m open to alternative approaches here. In the end, for this first approximation of an alternative position adjustment, I used the minimum AdjP48 line (0.24), with a linear increase in the adjustment based on the calculated position that follows the slope of the brown line. The net change resulting from switching from a calculated position to the new position adjustment is rather small. However, there are some (modest) systemic changes. The new adjustment favors PGs because it uses the same adjustment for them as the other smalls while penalizing SGs by holding them to the same higher standard. The slope for the big players is also steeper than that used in the current WP model, so centers don’t look quite as good. As I stated at the beginning: when you have a model that is already pretty darn good, the tweaks are at the edges. 27 Responses to "Rethinking the position adjustment"
One suggestion I’d make is to assign a position separately for the offensive and defensive statistics. If Dirk, for example, is playing a SF or even SG role on offence, that doesn’t change his defensive position where he’ll continue to guard a C or PF. Though that also raises the question of team construction. If Dirk is playing a SG role on offence, is anyone picking up the PF slack? Or rather, if Bargnani is playing like a SG on defense, are any of his team-mates filling the role of C, or does he/they need to be penalised for not fulfilling to ensure the average assignments still add up to 0.5. Great post. And interesting work. I had a related on-line conversation with Devin here over Dirk. The traditional adjustment does under value him, I think. But, one of the things that makes it work on Dallas is that Marion is also a combo forward who can move inside. It would be amazing to see these in the future! I cannot wait for the newest changes to be implemented. I trust that this would still be useful when calculating Wins Produced for other leagues, such as the Spanish ACB or even the WNBA. As a side note, are you doing anything with individual defense? I have heard that there was a study done with individual Defensive Rating, but that it showed no significant changes. I am just wondering how you did that, and if you tried anything to remove some of the team-based emphasis. For example, Steve Smith had a Defensive Rating of 103 in 2002-03, league-average for that season, but he played for the Spurs, who had a team Defensive Rating of 99.7. In contrast, on the lockout-season Bobcats, Tyrus Thomas had a Defensive Rating of 106 on a team that had a Rating of 110.4. Of course, if we do do an individual Defensive Rating adjustment, that would also have to have a Position Adjustment. I love Wins Produced; I am just brainstorming to answer the critics. Although-if you have haters, you must be doing something right! Offensively it has been Marion who took up the PF slack. If I read the adjustment correctly he has also been on of the biggest looser of the adjustment in favor of Dirk. > One suggestion I’d make is to assign a position separately for the offensive and defensive statistics. I think that’s a good idea in principle, but I wonder if there’s really enough in the defensive box scores to make it work. The current WP calculation for defense doesn’t seem particularly involved. Lutz did a cluster analysis of NBA players and published at Sloan. (http://www.sloansportsconference.com/wp-content/uploads/2012/02/44-Lutz_cluster_analysis_NBA.pdf) I have some concerns about methodology, but I’ve been wondering about the traditional player positions for a while. >… why should we punish point guards for being so good at their jobs? The same reason that you ‘punish’ centers for playing in the low post. The purpose of position adjustment is – ostensibly – to provide a contrast between expected performance and actual performance. It seems like using the box scores can lead to over or under performing players can get mis-categorized. For example, the calculations suggest Bargnani is a SF/PF rather than a C/PF. It also seems to me that WP position adjustment implicitly assumes that a traditional lineup is the way to play. If the line up isn’t C,PF,SF,PG,SG, then the total Wins Produced per game may stop being 1. Doesn’t the need for position adjustment indicate there is something wrong with the WP calculations? Or: What is the significance of the position adjustment? -Is there some stat missing from box scores? If so, what is it? Isn’t WOW saying, “Here are the stats and weights that produce wins, except if you’re short, they produce a little more.”? @Russ See below re defense. The “penalty” issue will be accounted for in the upcoming (spoiler alert) WP for coaches! @Andrew and @Johannes That’s right, Marion was really the PF and Dirk was the SF. This, btw, could partially answer the defense conundrum. If you have a player who is a PF offensively but too short to guard the other team’s PF, you could compensate by having a big SF like Dirk to pick up the defensive slack. One could imagine a team (Sam Hinkie are you listening?) drafting Olynyk in the first round to play the Dirk position and then drafting a small/quick rebounding maniac like D.J. Stephens in the second round to play the Marion role. You need to keep in mind that what we care about is marginal value. If all PFs are more productive than SF’s as a whole, you need your PF to be more productive than the average PF not the average SF to get any marginal value as represented in Point Margin. Seriously, I know you want a catchy intro, but c’mon. That’s just not a thing that “many” believe. And most of those who might be thought to believe it (I don’t know any physicists and barely any physics) are talking about specific instances where those laws fail to explain the behavior of particles. @rmummery and @Nate Getting to a finer level of specificity on defense remains a goal but, yes, the data are still sparse on who was covering whom at each moment unless you want to pay 10s of thousands of dollars for it. @Nate and @Jerbil First, I should emphasize that the position adjustment is not a factor in calculating expected team performance. For that we use the raw productivity stat, ADJP48. There are two purposes for the position adjustment (see my previous posts for more details on this). 1. An acknowledgement that you can’t play 5 centers. You may be able to get away with 2, or even 3, but not more. If the size isn’t balanced with speed and “floor stretch”, the team could never realize the raw productivity of the centers (fast break fest!). This means that there is an opportunity cost associated with using one of the limited 2-3 slots available for big players. The big players also use up limited real estate in the paint. So the position adjustment is meant to subtract the opportunity cost given that you could have utilized that paint real estate (and the roster spot) for another center. Now, as Nate (and Arturo as well) has argued, there is a similar argument to be made for the limited commodity of possession time that a PG gets. I’m not entirely averse to this. I just think that possession time is a less rare commodity than the paint space and, holding it constant, the PG play is largely interchangeable with the other smalls. In the end, I proposed a compromise to Arturo in this regard (more on this later, perhaps). 2. The second reason (and, to my mind, secondary) is the one that Nate mentioned, i.e. the ability to compare players directly between positions. @Jerbil, the position adjustment reflects how good a player is against the average for the position. It allows us to compare SGs and Cs by normalizing the “average” player at each position to .100 WP48. If the average center got 12 rebounds per 48 minutes while your center got 8, he would be below average by definition even though if he were a shooting guard 8 rebounds would be fantastic. You expect centers to rebound more, block more shots, and shoot a higher percentage on 2’s than a shooting guard, while you expect SGs to shoot a higher percentage on 3’s and get more steals and assists. When you say “Dwayne Wade is a fantastic rebounder….for a shooting guard,” you’re comparing him against average. If a center got the same number of rebounds he’d be horrible. You make position adjustments already. To circle back to the topic, I don’t know how I feel about doing away with opportunity costs and saying, “it’s up to the organization to make the pieces fit.” If you make the decision to play Bargnani, you’re not playing him as a SG. You’re playing him as a PF or C because he CANNOT play SG. You incur opportunity costs in post defense, rebounding, at-rim FGs, etc. One request: when you do post a revised model, I would *really* like it if you showed, with data, how much more predictive the model is than the prior version. Without that, it’s impossible to tell if you guys are just spinning your wheels or not. Please name exactly what you want predicted. Without that, it’s impossible to even consider fulfilling your request. @Xavier Q I don’t think you need to be concerned. The is not “to do away with the opportunity cost”. Rather, only part of the opportunity cost would be assigned to the player based on the role that he plays. The remainder of the opportunity cost is still there but it would have to be assigned to the coach. To me, this makes sense. It’s not the players’ fault that the coach decided to go small. If I had to suggest a change to WP, it’d be to treat defensive rebounds in a similar manner as team defense. Something like the team defensive rebounding distributed by minutes played. I have problems with individual defensive rebounds as a stat. I think players can increase their team’s chances of getting a DRB even when they don’t get it, but properly boxing out a player. Likewise a player who does not box out and his man gets the offensive rebound, he may have hurt his team’s chance to get the defensive rebound but didn’t get penalized for it. In a sense this is similar to team defense. Players can contribute or hurt their teams on that end in ways that is difficult to capture statistically. I think judging individual impact on team defensive rebounding by individual defensive rebounds, is in the same ballpark (though not as bad) as steals and blocks being used to judge individual defense. I think defensive rebounding is a team activity personally. What it comes down to is that defensive rebounding is a part of defense. And on defense it is much harder to capture individual impact than offensively. I’ve thought for a while the boxscores may have it wrong by tracking individual defensive rebounds instead of offensive rebounds given up (by the player one is guarding). The real goal of defensive rebounding is prevent an offensive rebound, just like the goal of defense is to prevent scoring. If that was tracked we may very well find out there are “stay at home” defensive rebounders, who don’t give up offensive rebounds but don’t grab them individually either. These players would be much more valued in a stat based on offensive rebound prevention instead of getting individual rebounds. A player like Marc Gasol could very well end up one of the best in this category, as opposed to a mediocre defensive rebounder. David Lee could be the opposite, a player who gives up a lot of offensive rebounds so he can get defensive ones. Overall I think offensive rebounding prevention would work better for the WP calculation if it ever starts getting tracked, but until then I would favor treating defensive rebounding as a part of team defense, personally. @Julien Some interesting thoughts there. I’ll try to make sure that Dave and Arturo think about this as they work on the update. > constant, the PG play is largely interchangeable with the other smalls. Considering that there can be many players in the paint, but there’s only one ball, it seems like possession is the rarer of the two. > the data are still sparse on who was covering whom at each moment unless you want to pay 10s of > thousands of dollars for it. I’m slowly chewing through a play-by-play data set, there may be some worthwhile stuff mixed in there. Even so, the data is mostly field goal attempts, fouls, rebounds. Because it’s in the data, I hope to look at the types of shots that players take — for example, what fraction of the player’s shots are ‘driving’ since that should be strongly informed by what role the player has on the court much in the same that the player’s 3-point attempt rate is. Similarly, it may be possible infer role information from the types of fouls that a player commits and draws. Another thing that’s popped out while looking at the play-by-play data is that coaches (and bench players) can draw technical fouls. That might also be something to look at when looking at a coaches’ WP48 adjustment. Slightly different topic, but I think this may ultimately be a bigger knock on Wins Produced (which I regard as the best available metric, BTW) than anything relating to positional adjustments. I am probably not the first person to make this observation, but the nature of a possession as an option expiring over 24 seconds is to my knowledge completely ignored by Wins Produced. For example, to simplify, if Carmelo Anthony is only given the ball with 5 seconds or less on the shot clock, the value of his possessions have deteriorated significantly from whatever the average possession is worth initially. If he can generate .80 ppp on these possessions he will be penalized by wins produced for producing at a below average rate, but he may actually be generating significant value over the average given the circumstances. People often complain that wins produced does not value volume shooters simply for being volume shooters. This clashes with people’s intuitive calculations of who is valuable. On this narrow issue I side with Wins Produced. Overall, as Dre has noted on numerous occasions, shots are not “created,” they are “taken”. Nonetheless, with 3 seconds on the shot clock, you could argue shots are created. If the same players are consistently relied on to take these shots, or more broadly to create offense in these situations (Melo, Kobe, Rudy Gay, Harden, etc….) 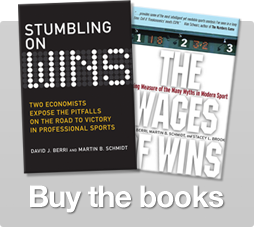 Wins Produced may be biased against them in a significant way. I would bet that these players typically have high usage rates. So even though the usage rate gripe doesn’t hold water, I submit that it is, in a sense, highly correlated with an argument that may hold water. Food for thought. It’s a bit ironic to see a “Take the shot!” situation described as an example of a player creating – rather than taking – a shot. The fact is that somewhere around 95% of the time that an NBA a team gets the ball, that team will end up taking a shot. For what it’s worth, according to my data set, Carmello’s shooting drops off around 10 seconds into the shot clock, and 0.8 ppp with 5 seconds left on the shot clock doesn’t seem to be very good by NBA standards. Regarding positions – my first passes at cluster analysis suggest there are about 10 shooting profiles in the NBA. I like what you guys are working on. I’ve expressed frustration before with the model just using the box score positions for players when their roles are actually different and this seems to take care of that. Looking forward to the changes moving forward. I’ve, at least partially, conceded the PG point to Arturo who has (offline) made some of the same points as you. Both assumptions, that the positions are continuous and that they are linear, were first approximations for this exercise (see disclaimer). I plan to revisit those assumptions. I don’t mean to complicate the issue further, but it seems that if you are using the box score to determine the position you could just as easily be lead astray. IMO there is a subtle difference between what the player is good/bad at what his role is on the team. For example, I’m one of the guys that has long argued that Bargnani is really a SF. The reason I’ve argued that is that the only difference between him and Danilo Gallinari on offense “a couple of years ago” was about 2 inches in height. Bargs was getting punished for being 2 inches taller and classified as a C or PF/C instead of a tall SF like Gallo. That’s a clear cut case of role. Barg’s role on offense is to shoot from outside, space the floor, drag a big man out, make a play here or there, etc.. Similar to Gallo. Now let’s take a guy like Bill Walton. Walton was a very good passer for a C when he was young and healthy, but there is no doubt he was a C. I don’t think you would want to shade down his position at all just because he possessed a skill that is usually associated with PGs. Plus, when a team has one of these hybrid players, they usually try to combine him with another complimentary hybrid. The perfect example is Dirk and Matrix. IMO, Matrix is a SF that just happens to be a great rebounder for the position. Putting him on the Pacers (with Hibbert and West) would be a waste of time. But he’s a great guy to put along side players like Dirk (who plays on the perimeter) or Amare (who is really a PF that played a lot of C and needed a lot of help on the boards). I’m not sure how a formula is going to be able to handle these kinds of nuances. I think it requires a subjective analysis of roles. But I look forward to the results. Its interesting how high school players tend to play their “true” positions more often than in college and pros.